VirusTotal lets you upload a suspicious file for scanning by 32 separate antivirus programs. 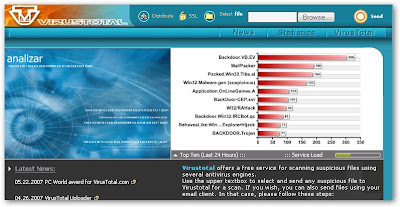 If you don't have an antivirus program handy on your computer or you don't trust the one you have installed, VirusTotal makes for an easy way to maintain your peace of mind. To upload a file is a three step process. First decide if you want to send your file to an antivirus company for further analysis. You might not want to if your file contains private information. Then decide if you want to use SSL to securely upload your file. Finally, browse to the file you want to upload and click Send. Depending on how high the server load is, you may need to wait some time to get a report on whether your file is infected. You can also email a file for scanning by sending it to scan@virustotal.com with the subject line "SCAN". It can't be bigger than 10 MB though. You will receive an email report on the file once the scan is complete.